Macross Plus concentrates on 3 main charactersl Isamu, Guld, and Myung. These threee have been friends since they were very young. 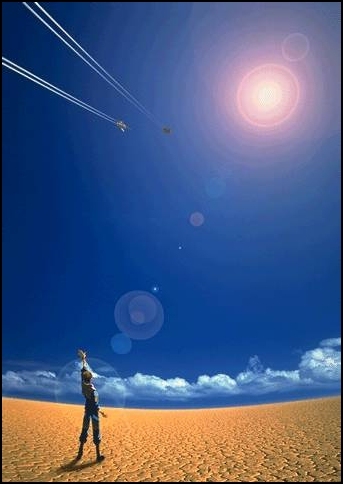 Both Guld and Isamu wanted to be test pilots and they have got their dream. Myung wanted to sing, but decided to become the producer of the new singing sensation 'Sharon Apple'. Something happened which caused them all to go their separate ways. 7 years later they find themselves together again, and that incident is still causing problems. Isamu and Guld are testing opposing new VF systems, whilst competing for Myungs affections. Throughout the four episodes you get to witness flash backs, which do not help you understand what actually happened. This is a good thing as when you are finally told you had no idea that the whole series was dealing with that theme. Sharon Apple benefits from some average to poor CGI [todays standards] however everything gells well, and I can not help but recommend the four episodes. Bad news is that there is a movie as well. The movie includes parts from the series and takes some out and adds some new bits in. Quite why there is not a version with all footage in is a mystery. Suffice to say the movie is very poor quality, so you are best of watching the four episodes. Macross Plus has an amazing soundtrack [Philharmonic Orchestrated]. The 'Voices' song is particulary good. I can not do anything but recommend this anime to everyone. Just watch it.